In the new poll 67 percent of those surveyed said the 1973 Supreme Court decision should stand. Most Americans support Roe v. Wade, the Supreme Court decision that legalized abortion rights, a new survey shows. 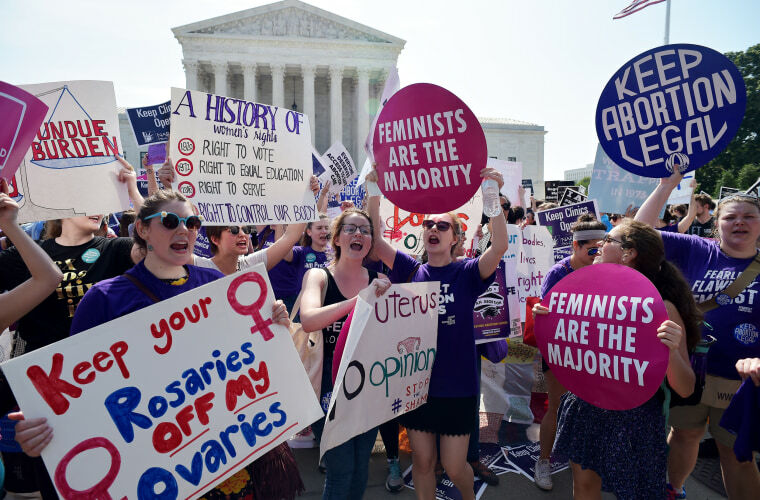 The Kaiser Family Foundation poll of 1,492 Americans found that 67 percent support the ruling that legalized abortion rights for the whole country, while 29 percent would like the Supreme Court to overturn it. It’s a big question now with the pending resignation of Justice Anthony Kennedy, who has provided the “swing vote” supporting Roe v. Wade in legal challenges. Republicans who control the White House, Senate and the House say they would like to see a new appointee to the court who would vote to overturn the ruling. Kaiser interviewed 1,492 adults by telephone for the poll, which was conducted before Kennedy announced he would resign. The margin of error is 3 percent either way but Kaiser says the group it interviewed is representative of the nation as a whole. When divided by party affiliation, about 53 percent of Republicans said they would like to see Roe v. Wade overturned. But 81 percent of Democrats and 73 percent of independents said they would not want to see the 1973 court decision reversed. In Roe v. Wade, the Supreme Court ruled 7-2 that the right to privacy extended to a woman’s right to have an abortion. It gave states some leeway to regulate abortions, but not to ban the procedures outright. People opposing the right to abortion have fought the ruling ever since, bringing challenge after challenge to try to find a way to overturn the decision. States have also sought to reduce access to abortions by regulating clinics, limit who can get the procedure under what circumstances, and by refusing to fund clinics that provide abortions. Congress has ensured that federal funds may not be used to directly provide any abortions. The Kaiser survey found that 42 percent of voters say they would be more likely to vote for a candidate who supports access to abortion service, while 29 percent said they would be more likely to vote for a candidate who would restrict access. About a quarter said that abortion questions would not influence their vote. CORRECTION (June 29, 2018, 12:57 p.m. ET): An earlier version of this article misstated the vote on the Supreme Court in the Roe v. Wade decision. The court ruled 7-2 in favor of legalizing abortion, not 7-3.